Every once in a while you come across some advice that is so simple and beautiful. Sometimes it is really hard to let go of what was…especially when it was something good or something important. But the only way to live is to be able to let go, to have faith, to accept what is. During the season of Lent, may you (may I!) 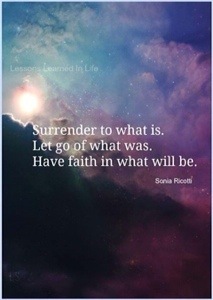 spend some time thinking about what needs to be let go from your life, what needs to be surrendered to, and what you need to have faith in. I don’t know what is coming tomorrow, but I know Whose hand tomorrow is in. Wow – did that hit home with a situation that I’m dealing with. Thank you. Thanks for reading, Bonnie! I am always so grateful when something I have written is helpful to someone!